Conference Rental, the leading wholesale rental provider for conferencing microphones and language interpretation equipment, has announced the opening of a satellite office in NYC to better serve audiovisual rental and staging companies, including AV services at hotels and convention centers, as well as language service providers and meeting planners in the greater New York City area. 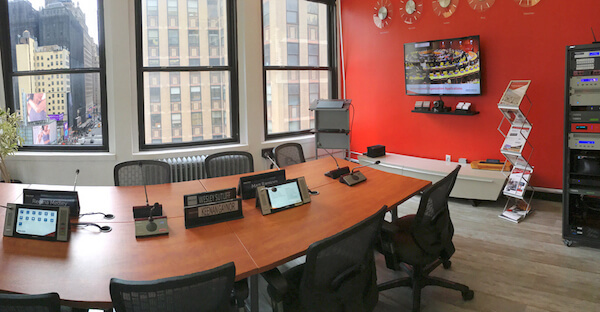 Conference Rental’s NYC office has emerged as a key rental center for the San Francisco-based company. In 2012 the company opened its first satellite office and warehouse in Beltsville, a few miles from Washington, D.C. Since then the demand for conferencing technology, especially multilingual events on the east coast, has boomed. In order to address this rising demand a new office located in Midtown Manhattan, near Penn Station, is now open to support events of any size. Conference Rental offers a wide variety of equipment, including push-to-talk conference microphones, which are an ideal solution for hotel meetings and conferences, especially corporate events. Also available is the digital infrared wireless conference microphone which is guaranteed interference free. This system is a perfect fit for Manhattan which is highly saturated in Wi-Fi. With the support of Conference Rental’s inventory from the Beltsville warehouse, the NYC team can execute large size international events. In fact, Conference Rental holds the largest inventory of conferencing equipment in North America including 1,000 push-to-talk conference microphones, new generation interpreter consoles, full-size interpreter booths, and over 2,700 digital infrared language receivers which allow language distribution in up to 32 languages. The company has proven able to handle multiple simultaneous events and high-profile congresses such as the G-20 Mexico Summit and the IMF World Bank Annual Meetings. The NYC rental operation is led by Keenan Gaynor. Mr. Gaynor joined Conference Rental in February 2014 as an Account Manager, with an extensive background in both audio engineering and project management. “With the opening of our NYC office, we can proudly serve A/V companies and language service providers in the greater New York City area with the quality, trust and customer service that we’ve been notorious for throughout the rest of the US. Regardless of deadline, we can now guarantee same-day delivery throughout NYC and its surrounding suburbs”, says Keenan Gaynor.